Team building for adults and Kids. Corporate paintball games. 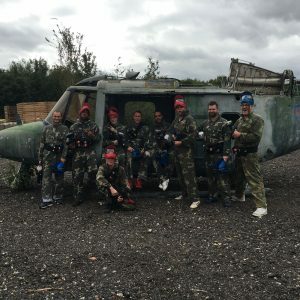 With a host of sites across the Home Counties, RW Paintball can offer team building activities and corporate paintball games. Most sites have short travel times from London so are perfect for company days out. We also welcome football teams, youth teams and clubs. Days can be designed to include strategic games and ensure you all work together whilst having great fun. The ultimate team building activity! Playing paintball, you’ll all work together to achieve a single goal. Planning and communicate under pressure are needed to succeed. Our scenarios ensure your team must work together giving them plenty to discuss during game breaks. All of this contributes to great team morale. Most of our sites offer the adult game and can accommodate midweek or weekend game. A fun filled, adrenaline packed, day awaits in one of our woodland paintball sites. Click here for more information on our adult (12yrs+) paintball games. All the benefits of paintball but without the pain! When playing on site, the scenarios and environment are the same as they would be if you played paintball. This creates a great experience and lots of team interaction. All ages are welcome from 8 years old. This game is perfect for school groups, youth centres, corporate team building and any other occasion. A limited number of sites now offer laser but we do have teams who can come to you! Creating a corporate laser tag experience at your own venue! For groups aged 8-11 years. Low impact paintball is great for schools and youth clubs of any kind. Played in the same zones as our adult game. The pump action weapons slow things down to a safe speed, perfect for a younger age group. Low powered, pump action, weapons ensure added safety for our players! We organise team building days for groups of 15 -200 across. Working with you we can bespoke your day. Most of our sites offer outdoor team building activities and corporate paintball. Our amazing, fun packed, paintball and laser tag days offer teams the chance to get to know each other, bond and work together. We’ll set game scenarios which help build better communication and encourage working together. For peace of mind, every site regularly has a full risk assessment and is fully insured. All groups will be briefed in the rules and regulations prior to playing. Our experienced marshalls are experts in maintaining the balance between fun and a safe day of paintballing.